Salvatore Ferragamo Acqua Essenziale Blu inspired by the scent of the sea. 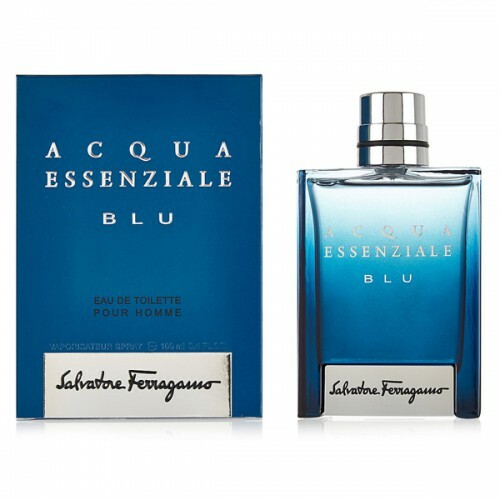 Salvatore Ferragamo Acqua Essenziale Blu 100ml. Eau De Toilette inspired by the scent of the sea water, the force of the waves and nature, is a new version of the publication Acqua Essenziale 2013. Blue is the color for Ferragamo inexhaustible source of inspiration, a symbol of masculinity and intriguing modern times. Resolute and seductive, fresh and intense perfume Salvatore Ferragamo Acqua Essenziale Blu Pour Homme sings energy, charisma and vitality of the modern man. Inspired by the authentic style of Salvatore Ferragamo, Acqua Essenziale Blu opens new sensory dimension. Savory vibration green cardamom, grapefruit energy and freshness of bergamot create a rich and gentle beginning of the song. The "heart" of the original focus of water molecules cascalone connected with the scent of Atlas cedar and smoky shades of leather oil kipriol and then triumphantly sounded a note of lavender. Saturation characteristic "loop" is manifested through the sensual benzoin and warm amber. Perfume creation Acqua Essenziale Blu inspired blue, the scent of sea water, the extraordinary power of the waves and the beautiful nature. Acqua Essenziale Blu - seductive and determined, intense and fresh aroma, glorifying the charisma and energy of modern man. Acqua Essenziale Blu - the embodiment of the authentic style of Ferragamo Salvatore. Acqua Blu Essenziale open chords of green cardamom, accompanied by bergamot, lemon zest and molecules paradisone. (Molecule paradisone 20 times more intense Hedione and gives an intoxicating floral compositions sound). At the heart of the fragrance - Atlas cedar, lavender, and the molecule kipriol cascalone. Hot established base of benzoin, tonka bean, ambroksana and deep, smoky shades of patchouli.